Two South Florida LGBT groups plan to discuss next week what they will do locally in support of the June 11 National Pride March in Washington D.C., which has attracted the interest of more than 100,000 people. Other groups plan to attend the D.C. march, but have no plans to do something in South Florida. 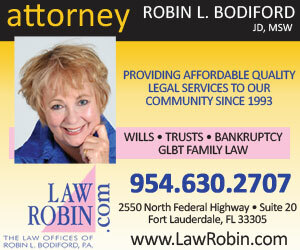 in Wilton Manors, Jobin said. Jobin said he has emailed other nonprofits, but so far only Equality Florida’s Broward chapter has confirmed it will attend. However, the Pride Center in Wilton Manors told SFGN they would attend as well. Our Fund also plans to discuss what they will do on June 12, the anniversary of the Pulse nightclub shooting in Orlando, Jobin added. National Pride March’s Facebook page was by New York City resident David Bruinooge. It will coincide with the annual D.C. Pride weekend. Some South Florida LGBT groups are asking their members to go to the National Pride March, but have no local plans. “We’re encouraging our members to go to D.C.,” said Rand Hoch, President of the Palm Beach County Human Rights Council, “That may change as time goes on.” Tony Plakas, CEO of Compass Community Center in Palm Beach County, wrote in a message, “We have emails out, but we’ve gotten very few solid leads. OUT Miami Foundation will rent a bus and take a group to march in D.C., Executive Director Jaime Bayo wrote in an email. National Pride March would be the third mass protest event created in the wake of the election of President Donald Trump, with more than 30,000 people so far indicating they will attend. The January 21 Women’s March on Washington brought an estimated anti-Trump protesters to the nation’s capital, with millions more protesting across the country and the world. Another mass gathering in D.C., the , is scheduled for April 22. More than 7,000 people so far have indicated they will attend.